IJC Future steps could include recommendations for flood control structures, such as a dam that was begun in the 1930s in Quebec but was never finished. Low-lying areas around the lake in Vermont and New York were inundated by the spring runoff that kept the lake above flood stage for more than two months in 2011. More than 44 billion gallons of water were extracted daily from the Great Lakes-St. Lawrence River Basin in 2011, according to a new report. Of the region’s states and provinces, Ontario withdrew the most water, at about 37 percent and Pennsylvania took the least at .07 percent. Uses for the water include irrigation, public drinking and industrial needs. That amount does not include water used for hydroelectric energy. When including energy uses, the picture changes dramatically. Quebec, New York and Ontario together make up more than 97 percent of the water withdrawals. 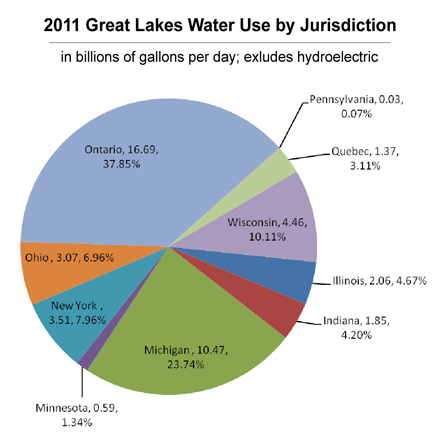 The findings are part of an annual report recently released by the Great Lakes Commission. The full report can be found here, as well as previous years’ reports.